<!-David Young Cameron 1865-1945--> David Young Cameron. The Turkish Fort. Sir David Young Cameron, R.A., R.S.A., R.S.W., R.W.S, R.E. 1865-1945. The Turkish Fort. 1909. Etching and drypoint. Rinder 409. 5 1/2 x 10 3/8. 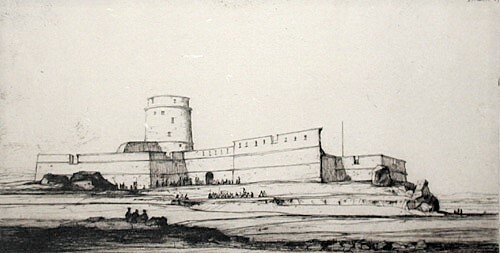 The fort is on the Mokaltam Hills, near Cairo. Signed in pencil.$275.